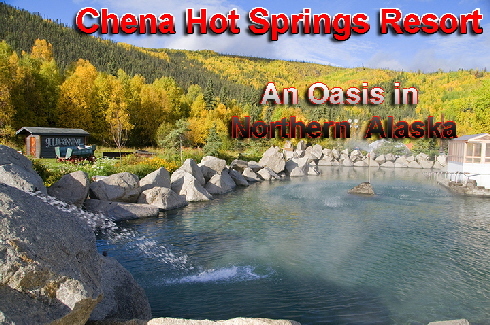 You really have to know how to get to this "oasis of comfort", but once you arrive, Chena Hot Springs Resort is truly a great destination resort for outdoors adventure enthusiasts. 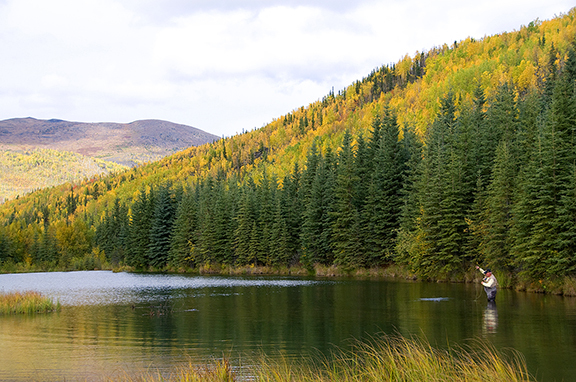 Located a little over an hour north and east of Fairbanks, Chena lies literally at the end of the road. From the first moment my husband Larry and I crossed the bridge into the resort, our eyes captured the essence of the facilities. Some of the original buildings, like the check-in desk and restaurant, are over 100 years old, built with local timber in the early 1890s by Alaskan explorers. 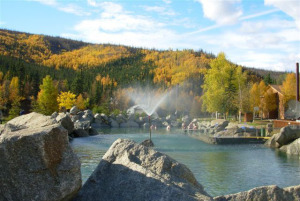 Chena Hot Springs Resort has become world famous for their legendary healing mineral waters and the beautiful Aurora Borealis displays that occur 200 nights a year on average. 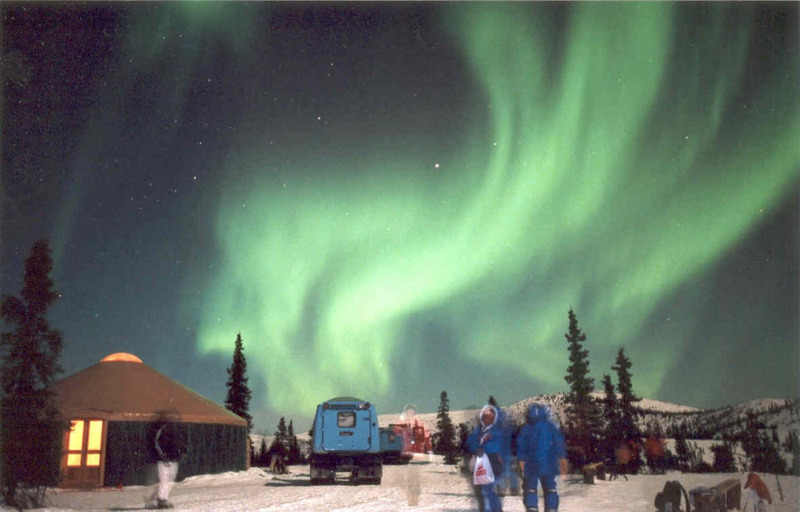 Unaffected by light pollution, the aurora is visible to the naked eye during the winter months. The resort's isolated location also creates the perfect environment for seeing some of Alaska's most beautiful wildlife up close, particularly moose. In summer, numerous activities are available at the resort including horseback riding, ATV tours, hiking, bicycle tours, dog cart rides, etc. Larry and I took a fun 45-minute ATV tour through the property that traversed several small lakes constructed in part as a result of several beaver dams. The views from some of the higher trails were spectacular, since our visit was during the fall and the leaves were beginning to turn from green to yellow to red. I also enjoyed a 1-hour horseback ride. With only 6 riders plus the guide, it was a great change from the usual resort trail rides which are often more than a dozen riders! We were able to take our time riding over streams and up steep trails to other scenic sites overlooking the hills which surround the resort. Of course, we had to try the hot springs. New women's locker rooms include heated floors, which we are sure are a bonus during the winter months. After picking up our towels, we headed out a semi-covered walkway towards the hot springs. At first, the water seemed very hot but after a few minutes, we adjusted and were able to explore the entire natural pool. If you don't want to be outdoors, an inside heated pool is also available. In the winter, the dog cart rides become dogsled rides. You can also take a snow coach tour (similar to the vehicles used in the Antarctic region).For additional entertainment, visit the unique Aurora Ice Museum, an example of renewable energy engineering. The facility is kept operational year round with the same geothermal energy that keeps the resort open for business. And, of course, the hot springs are always open and most enjoyable in the cold weather! The newest accommodations are a two-story Moose Lodge. Built in 1998 when the resort was purchased by the current owners, lodge rooms were renovated in summer 2007. These are spacious rooms with two queen beds, 14 inch mattresses, full bath, 8 channel TV, hair dryer, coffee maker and telephone. Also available are Signature Rooms, built in 1979 and renovated in 2006. Half the size of the Moose Lodge rooms, they have two double beds, 3/4 bath with shower, TV, hair dryer and coffee maker. For larger families, the Family Suites are ideal. They offer two separate bedrooms divided by a shared 3/4 bath. One room has two double beds, while the adjoining room has two twin beds with additional exterior entrance. For the more adventurous, the resort also offers RV camping sites between May and September, and unique Yurts. The Mongolian style yurts include three cots ready for your sleeping bags, a table and chairs are added for your comfort. Peace and quiet surround the entire resort. Even just a few steps away from the buildings, you may encounter a moose, like we did! And with a private landing strip, Chena Hot Springs Resort is as close or as far as you like. 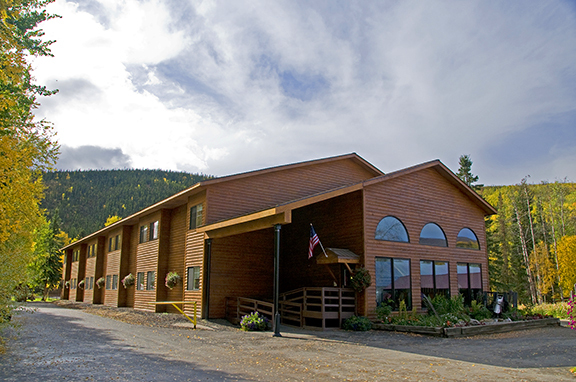 For more information or reservations, visit http://www.chenahotsprings.com or phone (907) 451-8104.